Carrying out the Action Program of the Provincial Party Committee and the Resolution of the 10th Provincial Party Congress, the Provincial People’s Committee of Kien Giang have directed the Department of Agriculture and Rural Development to complete 12 programs and projects to speed up agricultural restructuring towards higher added value and sustainability, to lay a more solid foundation for realizing the sustainable countryside construction target. Implementing the agricultural restructuring and new countryside construction program, Kien Giang province adopted a new production approach where businesses, farmers and cooperative entities joined hands to produce and consume products according to value chains linked to the global system; renovated agricultural cooperatives in a bid to make, process and consume products on a larger scale and with a higher quality. As a result, in 2015 - 2017, the province’s agricultural production value grew 2.73% (versus the plan of 4.5% set for 2020). The share of the agricultural sector in the gross regional domestic product (GRDP) accounted for 35.75%, down 6.5% against 2015 (42.22%) and 0.55% lower than the plan set for 2020 (36.30%). Inside the agricultural sector, the cultivation share shrank while other fields increased their shares. In 2017, the cultivation sector declined 5.49% over 2015 while animal husbandry, fishery and forestry expanded by 4.28%, 9.47% and 0.58%, respectively. In 2017, the production value on an hectare of cultivated land reached VND70.49 million a year (compared to the plan of VND100 million a year by 2020) while the value on the same area of water surface was VND118.26 million (compared to the target of VND130 million by 2020). Agricultural production is effective and the countryside appearance brightens. At present, on average, a commune has fulfilled 15.4 criteria, an increase of 1.9 criteria over 2015. One district was certified new countryside and 49 communes achieved 19 criteria (compared to the goal of 59 out of 118 communes in 2020). Only five communes reached 6 - 9 criteria. By 2020, all communes must achieve 10 criteria or more and will, on average, meet 16.6 criteria. 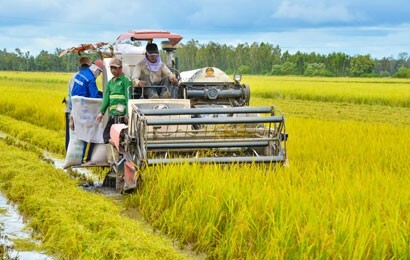 In the past, the agricultural sector of Kien Giang province accelerated high-tech application to production and many new models were highly productive, for example, shrimp farming, offshore caged fish farming offshore using Norwegian technology, large rice field production, mixed shrimp and rice farming, and netted vegetable planting. The province has two high-tech agricultural areas: A 762-ha rice farming area invested by Trung An Company and a 650-ha fish farming area invested by Trung Son Company. One company applies Norwegian high-tech to offshore caged fish farming. Mr. Nguyen Van Tam, Director of the Department of Agriculture and Rural Development, said to successfully restructure agriculture, the province will continue to review sector and field development plans to match ecological sub-regions in the coming time. On that basis, the province will build specialized farming areas and key commercial farming areas and develop implementation roadmaps for key fields like rice and fishery. Kien Giang will continue to execute the policies of the Government of Vietnam on encouraged investment in agriculture and rural areas, policies on encouraged cooperation in production with consumption of agricultural products, policies on GAP-based production, and policies on specific incentives for agricultural and forestry development. The province will stimulate and facilitate enterprises, cooperatives and farmer households to closely associate with scientists, researchers and authorities for production and business development; encourage contract-based product consumption; strengthen training, technical guidance and practical skills for farmers, and transfer science and technology to farmers for better farming. At the same time, the agricultural sector will also focus on improving the quality of agricultural extension activities; accelerate the transfer and application of scientific advances in agricultural production, and prioritize new countryside construction. It will research and widely apply advanced processes and techniques and accelerate mechanization in agricultural, forestry and fishery production. It will scale up effective production and technology transfer models, especially in safe and effective vegetable and fruit cultivation and husbandry.